Apostolic Titbits: Television, A Boon or A Bane? Television, A Boon or A Bane? A teacher from Primary School asks her students to write an essay about what they would like God to do for them. At the end of the day while marking the essays, she read one that made her very emotional. Her husband, who had just walked in, saw her crying and asked her, "What happened?" She answered, "Read this. It's one of my students' essay." At that moment the husband said, "My God, poor kid! What horrible parents!" She looked up at him and said, "That essay is our son's!" What can we learn from this story? We ought to judge ourselves first and then dare to look at others fault. Children are neglected of parental love because of such lifestyle influenced by television. Of course when it is properly used in a limited way, television viewing can be informative and useful. The boon of television will become a bane when it is used without control and allowed to rule the household of believers. 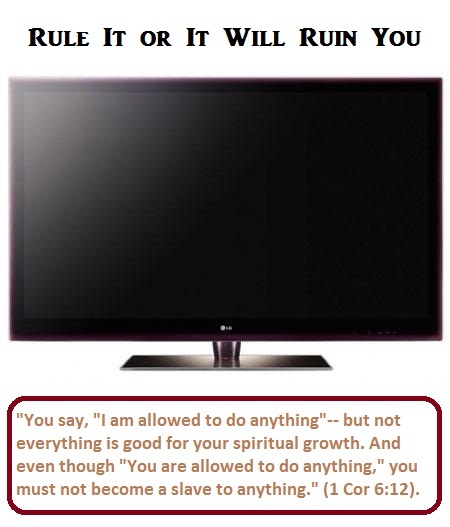 The TV is this generations idiot box that has consumed all the time of every household until they become spiritually poor and ineffective in their lives. May God open the eyes of the parents everywhere either to use the television in a limited way or completely keep the household be a television-free zone so that their entire household can spend time together, have time for one anther and be devoted to the Lord. The home should always be a replica of heaven on earth. It should be the model very close to heaven. If Television controls the home, already Satan and his demonic minions has become the "head of the house, the unseen host and the silent listener to every conversation" to destroy the blessing of the sweet home that God has given to us to enjoy and glorify God! The devil through the television wants to make the home a closest thing to hell on earth. Why allow the devil and then fret about the blessing less life we experience in our home.